It’s been a while since I’ve posted, hasn’t it? I’m afraid that most of that time has been spent taking photographs of ED-209 and starting my new job at The Big British Castle. Nonetheless, I’m still alive. It’s because of my love of ED-209, that loveable rogue from the Robocop films, that Becca bought me this wonderful t-shirt for Christmas. It’s one I’ve had my eye on for some time, since seeing it on Last Exit to Nowhere last year. Last Exit are one of those places that I end up going and looking at quite a lot, because they have rather nice movie based imagery that isn’t just a straight lift and shift from the movies in question. This, however, is the first t-shirt that I’ve ended up getting from them. Normally I wouldn’t go for t-shirts that are printed on a white or creamy fabric, but since Becca bought this for me I didn’t have much choice. Frankly though, in the flesh I rather like this one. As a larger chap, I tend to think they help to make me look even bigger than I am, but happily this doesn’t seem to be the case with this one. This despite the fact that when I unwrapped it on Christmas morning I was convince that I’d been sent a t-shirt one size larger than I needed! As it turns out, although the t-shirt was the same size as everything else I own, the neck was considerably larger and the shoulders a bit wider. A bit weird, but nothing that was off-putting to me once I put the t-shirt on. 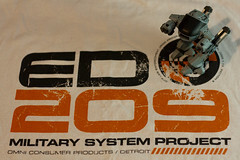 “ED-209” is available from Last Exit to Nowhere for £18 and is printed on an “ice grey” shirt of no specified brand. And yes, I would buy that for a dollar. Nice T-shirt I hope you look after it, My one was stolen in orlando. and Last exit don’t have them any more.